Fuel economy (litres/100 km): Mazda3: 9.2 City, 7.0 Hwy; Sport: 9.8 City, 7.4 Hwy. With four metres of snow still lying on the golf course here, high in the mountains, this is no place for a sedan, let alone a hatchback, but here I am, gunning a Mazda3 around the cones of a special course on the front nine. This is an all-wheel-drive Mazda3 – the first AWD ever offered on the model – and it’s gripping quite well. The system is unique to the car and its all-new chassis, not just borrowed from the existing CX-3 or CX-5 SUVs. It’s a $1,700 option on the mid-range and top-end models with automatic transmissions. There aren’t many sedans or hatchbacks available with AWD, and among “mainstream” cars, the only real competition is Subaru. But Mazda isn’t looking to take away sales from Subaru – it’s doubling down on making its cars more versatile now that some makers are focusing on SUVs and crossovers, and it’s eyeing the compact models from the premium makers. After all, Mazda doesn’t have its own premium brand (in the same way, for example, that Honda has the Acura alternative, and Toyota has Lexus), so it’s starting to offer more premium features with its regular lineup: a Bose sound system inside a quieter cabin, a smoother ride thanks to its G-Vectoring technology, and more comfortable seats and materials. In those small, premium vehicles, all-wheel drive is a very popular option. According to Polk Canada, 97 per cent of buyers of the Mercedes-Benz B-Class and 96 per cent of buyers of the BMW 2 Series choose AWD; some 82 per cent of Audi A3 buyers choose the Quattro option. Mazda sees potential here, where the Mazda3 AWD is less costly than even the FWD versions of those German brands. 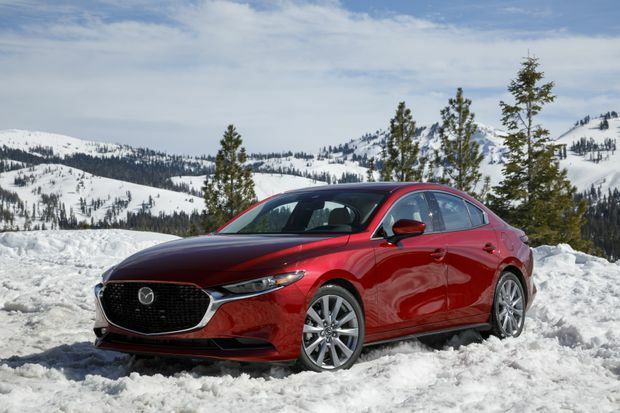 According to Mazda Canada’s own research, the desire for AWD is the most popular purchase reason for those luxury compact buyers – more popular than being reliable or good value for money. The all-new Mazda3 sedan and its hatchback sibling, the Mazda3 Sport, does not offer AWD with its less powerful 2.0-litre engine, nor with its six-speed manual transmission, though this is a marketing decision more than a technical obstacle. Here in the United States, the smaller engine isn’t even sold any more. The least expensive Mazda3 GX retails for $18,000, but the last expensive AWD version comes with the Mazda3 GS. This mid-range trim level includes many more standard features; it starts at $22,700 for a manual-transmission FWD, or at $26,000 for the AWD automatic. That’s well above the $19,995 of a base Subaru Impreza AWD. At the other end, the most expensive AWD Mazda3 Sport GT lists for $31,400. That’s at least $5,000 less than the AWD German competition, and still in the ballpark of its traditional competition from the FWD-only Honda Civic, Toyota Corolla and Hyundai Elantra. But does it work? Is it any good? I drove up here from balmy Sacramento, on some interstate but mostly winding country roads, many of which were wet with runoff from melting snow. I started in the sedan and switched halfway along to the hatchback, known as the Sport. The hatch is a sporty car in appearance only, however: it has the same 186 hp engine under the hood with the same transmission. It’s tuned slightly differently but this is not a vehicle for revving at the lights. The computer power within the AWD system, however, is incredible. It’s combined with Mazda’s own G-Vectoring Control Plus system, which constantly adjusts the suspension for a smoother, flatter ride, to make the vehicle more responsive around corners. “This new system is a fundamentally different strategy to what we were doing before,” explains Dave Coleman, Mazda North America’s manager for vehicle dynamics engineering. This means that when the car accelerates, more torque is sent to the rear wheels; when it brakes, more is sent to the front. And when it goes around corners, torque is sent wherever appropriate to maintain traction and keep the drive smooth. The complete integration of the system means there’s far more immediacy to the suspension’s response, which improves fuel consumption, despite the additional weight of the unit and shaft. The Mazda3’s fuel consumption is 0.4 L/100 km poorer in the sedan and 0.8 L/100 km poorer in the hatch – better than most. He’s right – I didn’t feel any of it, not on dry pavement, not on wet asphalt, and not on four metres of snow. The Mazda3s went where I wanted them to go, smoothly, comfortably and predictably. For an AWD car, that really is all you want.